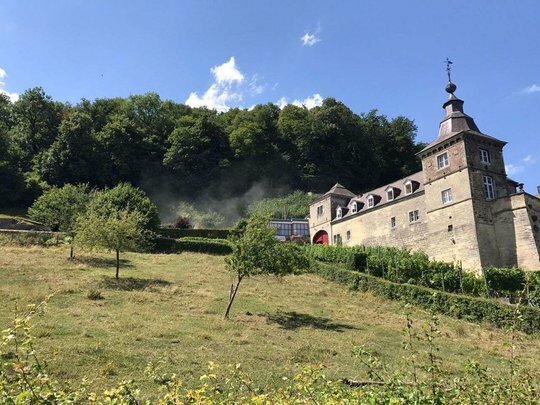 Château Neercanne in Maastricht considerable nuisance because of the fire in the caves in Kanne. In the caves fire broke out in a haystack stored there. The smoldering hay creates a lot of smoke, which extends through the network of passages direction Château Neercanne. Especially in the outbuildings of the castle, according to Peter Harkema, director, there is a lot of smoke and soot damage. Harkema expects it to take months before the buildings are clean again. He thinks the damage will be hundreds of thousands of euros. In the outbuildings, weddings and celebrations are planned in the future. They must now be accommodated elsewhere.